Another Involuntary Credit Card Cancellation! We all know (or we should, anyway) that mothers work harder than almost anyone. Whether they stay at home, or they hold down a job outside the home, women often shoulder much of the responsibility for caring for children. Most mothers work for pay, and they spend a lot of time juggling their careers, and the needs of their families. That's why a lot of women are "opting out" of trying to have a family and a full-time job, and choosing to stay home with their children full time. Let me tell you about a friend of mine, who gave up running a successful business to be an at-home parent. Did she know what she was giving up? That's hard to say. Her name is April, and I've known her since the ninth grade. Even back then, she had an entrepreneurial spirit. She was always the one raking lawns or walking the neighbor's dog to pick up a little spending money. She always told me that her ambition was to run her own dog-grooming business, because she loved dogs. After we graduated, we lost touch for a few years. I recently got into contact with her again, and what she had to say surprised me. It was tough for her and her family during that time. Her husband couldn't help with the children in the evenings, because his job required him to work 14-hour shifts. So, she did the job of both parents, all while working a full-time job and going to school. She worked really hard though, and ended up getting an associate's degree. She started her business, grooming and boarding dogs and cats. She was quite successful at it, building a loyal customer base who wouldn't take their pets to anyone but her. But, the 12-hour days took their toll. She told me that she just got tired of working her fingers to the bone every day, with rarely a day off, and then having to go home and work a full day there, too. She discussed it with her husband, and they decided together that the constant worry and stress weren't worth it, and that she'd sell the business and become a stay-at-home mom. A woman who stays out of the paid work force for three years will lose at least 37% of her earning power. This book also tells us that elderly women are more than twice as likely as elderly men to live in poverty. Contrary to what people may think, marriage isn't a lifelong paycheck for the stay-at-home wife. With more than half of marriages ending in divorce, women give up their permanent financial security when they decide to leave the working world. 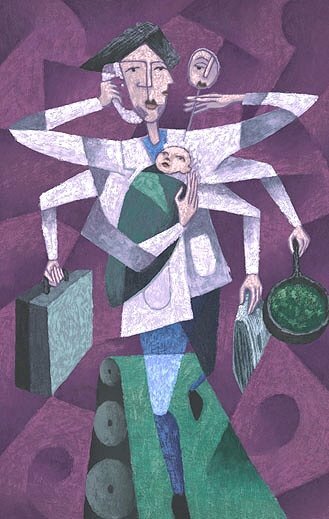 According to the book Leaving Women Behind: Modern Families, Outdated Laws by Kimberly Strassel, tax laws, labor laws, and employee benefit laws work against women who are trying to balance a career with raising a family. She says the laws are designed for couples where one is a primary wage-earner and one is a stay-at-home spouse, and that these laws punish any other kind of arrangement. Some would like to work a 25 or 30-hour week, allowing them to spend more time with their families, and these rigid laws make that tough for those who depend on their employer's health insurance coverage, pension plan, and other benefits.With all the things working against them, it's no wonder that many overwhelmed, overworked, and underpaid women decide to remove themselves from the rat race completely. April has been a stay-at-home mom for three years now, and she couldn't be happier. She tells me that when her children are both in school, she'll look into getting a part time job, or finding work that she can do from home. As she and I are in the same situation, I'm curious to see how well she fares, and I wish her all the best.